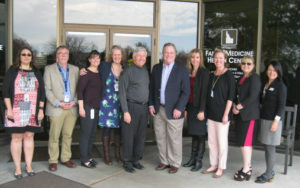 FMRI was honored to host Congressman Mike Simpson (R-Idaho) for a tour of the Emerald medical clinic on Wednesday, April 12, 2017. Simpson is a strong supporter of health centers and recently signed on to a letter encouraging the House Energy & Commerce Committee to reauthorize funding for the Teaching Health Center Graduate Medical Education program. Reauthorization of funds for this program will help ensure that Teaching Health Centers (THC) receive sustainable funding and remain viable for the future, a goal that is at the heart of FMRI ’s mission. Investing in Teaching Health Centers by providing necessary funding to preserve current programs will put the THC model on a path to long-term sustainability and growth. This includes ensuring a sufficient per-resident amount so that true costs of residency training are fully addressed. “Idaho is fortunate to have a strong advocate for community health centers in Representative Simpson. As a retired dentist he understands the importance of primary health care that supports individuals to take responsibility for their health, and also curtails healthcare costs”, said Dr. Ted Epperly, President and CEO at Family Medicine Residency of Idaho. Congressman Simpson had the opportunity to visit with other FMRI leaders including; Linda Clark, FMRI Board Chair; Penny Beach, MD, Chief Clinical Officer; Jamie Strain, Emerald Clinic Manager; Signe Blackman, Director of Nursing; April Howell, Associate Director of Nurs ing; Sabrina Allen, PharmD, Director of Pharmacy; and Brenda Sinclair, Director of Communications. “As policy makers in D.C. determine the direction of healthcare reform, FMRI will continue providing quality primary care to hard working Idahoans regardless of their insurance status,” said Epperly.